To support the return of heritage breed turkeys to Sonoma County join us at the Heritage Turkey Sunday Supper, this year on Sunday, November 4, 2018. The event benefits farmers, students, and local youth agriculture. In 2001, Slow Food USA started a project to reintroduce Heritage turkeys to American consumers. The initial goal was to encourage farmers to raise eight traditional varieties, as most of them remain perilously close to extinction. Our first national partner was the American Livestock Breeds Conservancy, which estimated that fewer than 1200 breeding turkeys of those varieties remained in the entire country. So why heritage birds? The Slow Food movement is committed to biodiversity. Even today all commercially sold turkeys in this country are the same breed – the Broad Breasted White. Bred for it’s white feathers (LOOKS cleaner when you cook it) and its huge breasts, these birds can’t fly, walk, or breed naturally. They are all products of artificial insemination and with no exercise and weak immune systems they often require antibiotics. When they are slaughtered their flesh is so bland that they are often injected with saline and veggie oil to improve their taste. We were encouraged in 2001 year to be turkey pioneers and order our thanksgiving bird from a breeder in Kansas, and along with the postage, it was a very expensive bird! Randi Seidner, who organized the project in the beginning, worked to find local small farmers who were raising turkeys, found one in Petaluma, and she raised about 80 that we promoted to our members. Through her we met the Thodes and other 4 H families. Slow Food’s passion for educating kids matched the tenets of 4H and we began our work. The first year (and maybe 2) Willie Benedetti of Willie Bird raised 200 heritage turkeys and we committed to selling them. After that, the fact that the heritage breed turkeys could fly and had more spirit made them harder to raise and transport to where they went to be slaughtered made Willie ready for us to move on. Now we were working closely with 4H families to raise 200 heritage turkeys per year. We ordered and paid for the poults, paid for their food and all expenses, and promoted them for sale. When the mobile processor we contacted to come to the farms and slaughter them backed out, our own Duck Man, Jim Reichardt saved the day. He arrived with his expert workers and amazing equipment and many of us hardy volunteers learned how to transform a live turkey into dinner. In the next few years we switched to organic feed, and began handing the project over to the kids, with Jim’s help each year with his equipment, his refrigerated truck, and storage facilities for pick ups just before Thanksgiving. In 2006 the official 4H heritage breeds club was launched in Sonoma County, and they have raised approximately 200 birds per year since then. 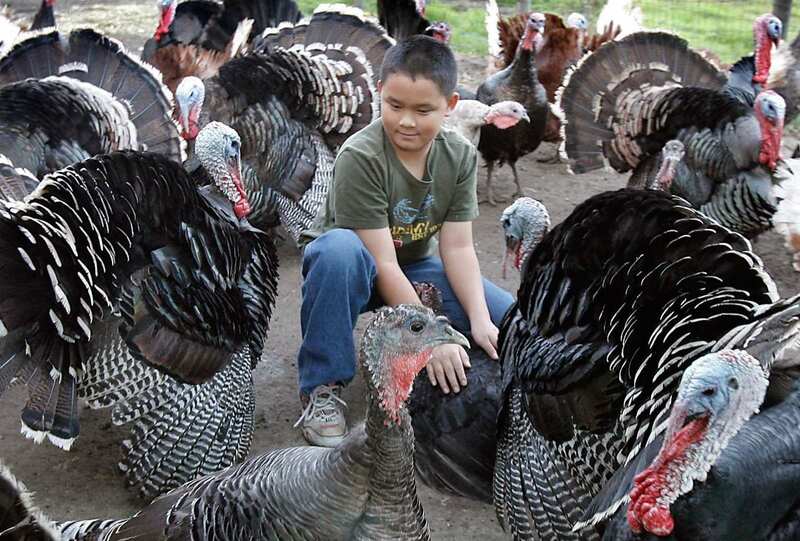 The kids are now in charge of the project and buying their own feed, and some are saving breeding pairs and hatching healthy local birds, while they learn more about breeding and raising turkeys. Jim continues to help with Turkey Transforming each year, and we now have chefs from all over the bay area joining us on Transforming day. This project has brought awareness to our community, our farmers, and our future farmers about biodiversity. When you buy your food locally, you support family farms and local farmland for future generations. If you’re interested in learning more about heritage breeds, the Livestock Conservancy is a great resource. The commitment raising these birds is a priceless life lesson for the kids, an opportunity I wish I would have had in my youth. Worth every penny per pound, as weall agreed our turkey was the best we had ever had and made our Thanksgiving more appreciated and memorable.